TRON: Legacy’s Legacy | Critical End! It’s no secret that we really dug Disney’s TRON: Legacy. Sure, it didn’t make either of our top films of 2010 lists, but it was definitely one of last year’s highlights. Which brings us to the DVD/Blu-ray release…or I should say, the DVD/Blu-ray/Digital/Blu-ray 3D/DVD+Blu-Ray/DVD+Blu-ray+Digital/DVD+Blu-ray+Digital+Blu-ray 3D/DVD+Blu-ray+TRON release. 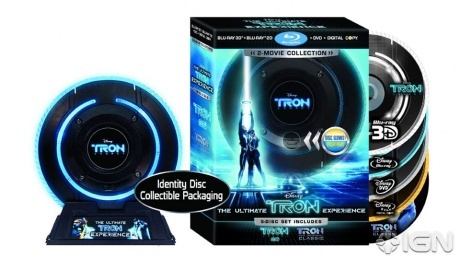 That’s right, Disney, known for overkill releasing style, plans to drop a staggering nine versions of TRON: Legacy on home video, two of which will feature a bare bones version of the original TRON. The only thing missing is a laser disc version. While I’m all about variety, this is mostly ridiculous. It would be one thing if you were getting something different on each disc, but how many formats do you really need the same film on? More info on each version over at IGN. This entry was posted on Thursday, February 10th, 2011 at 9:47 amand is filed under . You can follow any responses to this entry through the RSS 2.0 feed. Both comments and pings are currently closed.